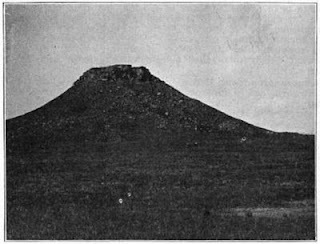 Here's an early photo of South Dakota's Thunder Butte found in a book published in 1918, now in the public domain and searchable via Google Book Search. The book is Stephen Sargent Visher's "The Geography of South Dakota." The caption beneath the photo reads simply as "Thunder Butte, Ziebach County. A typical butte. Note the team and rig near the base of the butte." Unfortunately, the scan is not very good and you can't make out -- at least not without a good deal of imagination -- any horses and wagon (or buggy). Also, there is no other real mention of this specific butte in the book. But, the photo is interesting as it does date from a time when my grandfather and his family were settled nearby. I believe that the photo was shot from approximately north or northeast of the butte. You can compare the old photo with ones I took from the same vantage point just a couple of years ago here.